The New York Post reported this week that Yahoo’s patent portfolio could be worth up to $4 billion, as the company is currently seeking bidders in an auction for its core businesses. While the company has not explicitly discussed a separate patent sale, the value of the patent portfolio is likely to be a key factor in any ultimate sale price. Envision IP identified 2,000 US patents currently assigned to Yahoo which are active and in-force (up from 1,986 that we reported last December). In that same report, we analyzed Yahoo’s sale of patents to to various companies, including Google, LinkedIn, Match.com, Pandora, and Visa. Yahoo’s 2015 10-K reveals the company reported almost $300 million in gains related to patent sales between 2013 to 2015 (See Page 58). The New York Times articles states that “Yahoo has sold $600 million worthof patents over the last three years”, however we could not verify this number based on Yahoo’s latest 10-K. The vast majority of Yahoo’s patents are related to software, with 68% of its US patents grouped in a software-related classification by the USPTO. 15% of its US patents are classified as business methods patents; patents that have been under scrutiny, and whose validity is still not certain, as a result of the Supreme Court’s Alice Corp. decision in 2014. 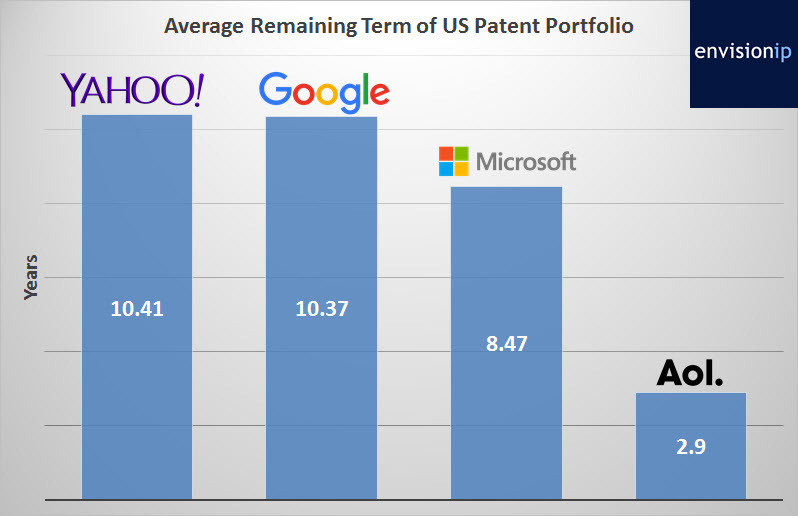 In order to understand how Yahoo’s patent portfolio compares at a fundamental level with its peers (and potential acquirers/bidders), we analyzed the remaining term and citations of Yahoo’s patent portfolio. We also analyzed AOL’s US patent portfolio, as well as the US patents specifically directed towards software and e-commerce/web-technologies owned by Google and Microsoft. Yahoo’s US patents have the largest remaining term of the group, with an average of 10.41 years of life remaining per patent. Google’s software patents are close behind with 10.37 years, and Microsoft’s software patents have an average of 8.47 years of life remaining. AOL’s patents only have a remaining term of 2.9 years. The company owns only 322 US patents, after having sold approximately 800 patents to Microsoft in 2012, which were subsequently acquired by Facebook. Interestingly, however, AOL had a surge in new patent application filings since the 2012 sale, with 182 applications filed between 2013 and 2015. AOL’s average remaining term may start to increase as new patents are granted based on the recent filings. It remains to be seen if the new patent applications are based on older technology with early priority dates, or if AOL is actually churning out new innovations and actively engaging in R&D, especially in light of its acquisition by Verizon in 2015. Based on a forward citation analysis, Yahoo’s patents appear relatively fundamental, and on par with software/web-related patents owned by Google and Microsoft. Yahoo’s reverse citations indicate that its patents may not be as strong in terms of surviving a validity challenge. 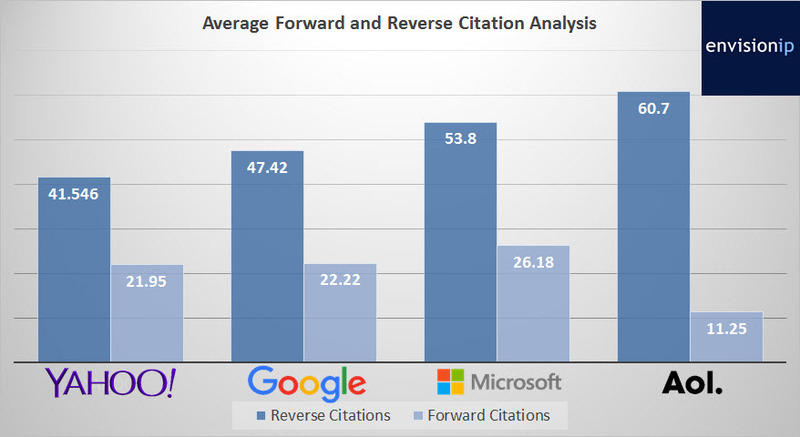 Yahoo’s patents have on average 41.5 reverse citations, with AOL’s patents leading the group with over 60 average reverse citations. * However Yahoo does not have a history of offensive patent litigation, except for a suit filed against Facebook in 2012 shortly after Facebook announced its IPO. The matter was subsequently settled out of court. Thus, Yahoo’s patents do not appear to have been heavily tested in federal court, or even before the PTAB in post-grant proceedings. Looking strictly at intrinsic data, and no external variables that cannot be supported by historical revenue figures, we next reviewed Yahoo’s 10-K to determine if the reported $3-$4 billion value for Yahoo’s patent portfolio is reasonable. Yahoo reported patent licensing and royalty revenue as part of a lumped “Other Revenue” line item on its 2015 10-K. The “Other Revenue” grouping “includes listings-based services revenue, transaction revenue, royalties, patent licenses and fees revenue. Listings-based services revenue is generated from a variety of consumer and business listings-based services, including classified advertising, such as Yahoo Local and other services.” (Page 51). Between 2013 and 2015, the average compound annual growth rate for “Other Revenue” was -9.3%. We prepared a discounted cash flow model of Yahoo’s US patent portfolio based on the above reported figures, and assumed that 50% of the “Other Revenue” could be attributed to patent licensing and royalty revenue (understanding that this may be an aggressive approach). Calculating the income before taxes over a span of 10.5 years (the average remaining term of the US portfolio), we find a net present value (NPV) of Yahoo’s US patents to be approximately $1.2 billion. To reach a valuation of at least $3 billion, a potential acquirer would have to have a 20 basis point increase in the current licensing revenue Y/Y growth rate, and achieve a 10% CAGR in licensing revenue through the remaining term of the patents. To reach a $4 billion valuation, a 15% CAGR in licensing revenue would need to be sustained. Furthermore, our model assumes a very liberal discount rate of 6.25%. Given the current market conditions for software patents, and business methods patents specifically, the risk of invalidity due to aggressive monetization techniques is heightened. We do not believe that a $3-$4 billion valuation for Yahoo’s US patent portfolio is realistic, and expect the patents to be valued in a range of $965 million to $1.34 billion, based on our intrinsic valuation. If a potential buyer does see the potential to heavily license and/or litigate the portfolio, this value could increase, but that increase would be entirely dependent on extrinsic variables such as a buyer’s motivation and intentions for acquiring the portfolio. In addition, the ability to secure higher royalty rates and litigation awards would increase the current valuation (however there is no public record to justify this as Yahoo does not have large historical patent litigation awards). In addition, we identified approximately 7,000 global patents and published applications assigned to Yahoo. However, we assume that the figures reported in Yahoo’s 10-K include all licensing revenue, from both US and foreign patent assets. 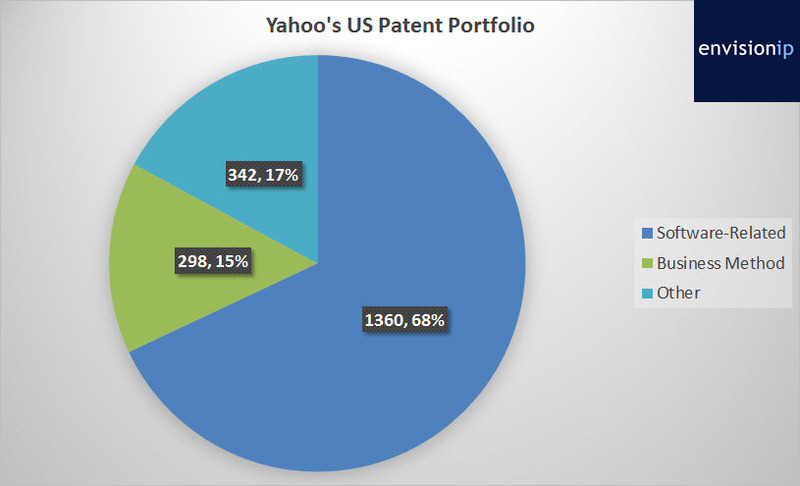 In summary, Yahoo’s US patent portfolio certainly seems attractive, as its fundamentals and remaining patent term are strong in comparison to similar patents owned by Google, Microsoft, and AOL. However, unless a potential acquirer can revamp the monetization of Yahoo’s patent portfolio significantly, and reverse the year over year decline in apparent patent licensing revenue, it is unlikely that a buyer would pay $3-$4 billion for these patents alone. *A reverse citation is a prior art reference considered by the USPTO during prosecution of the underlying patent application, and it can include art identified by the patent examiner, as well as art submitted by an applicant. A high reverse citation count indicates that the USPTO has deemed the patent claims novel over a larger number of prior art references. This presumably provides difficulty in identifying previously unknown prior art during an invalidity challenge. A forward citation occurs when a subsequently filed patent application references an earlier issued patent during examination. For example, if Apple files a patent application on server technology, the patent examiner may review a previously issued IBM patent. In this case, the IBM patent would receive a forward citation. A high forward citation count indicates that a particular patent may be fundamental to its claimed technology area and industry. It is important to note, however, that the strength and quality of patents must be determined using a variety of factors, such as claim analysis, prosecution history review, litigation analysis, etc., with citation counts being only one factor.